Design of Medieval Illustrated Gospel Texts. see: Christian Art (from 150). Note: Radiocarbon dating shows that the world's oldest illuminated gospel manuscripts are the Ethiopian Garima Gospels (390-660, Garima Monastery, Ethiopia), and the Syrian Rabbula Gospels (586, Laurentian Library, Florence). The older Garima Gospels, written in Ge'ez, the ancient Ethiopian language, and traditionally created by Father (Abba) Garima, the founder of the monastery and a native of Constantinople, have never left the monastery. Their 28 pages of religious paintings are designed in the early Byzantine style, and were probably created in a Syrian or Jerusalem monastery. For other early artifacts, see: Early Christian Art (c.150-550). a masterpiece of early religious art. background, the Chateau de Saumur. Small Christian communities, independent of Rome, clung to the very margins of the known world at the monasteries founded in Ireland by St Patrick in the mid fifth century. In 563 St Columba and twelve companions set sail for Iona, north-west of Scotland, where he founded the famous island monastery. St Augustine arrived in Britain from Rome in 597, sent by Pope Gregory the Great to bring Christianity to the Anglo-Saxons. The monks who came carried a silver cross and a likeness of Jesus Christ painted on a panel, and these images must have been extremely important to them as they preached to a people who could not understand Latin, nor read in any language. They also brought many books, for Christianity appeared to offer literacy and civilization, and books were essential props, tangible proof of their message. In fact, to the early monks, books were quite as important as any of their relics or vestments. The books they brought with them were soon being copied at the new monasteries which they founded up and down the country. 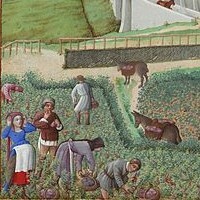 It was these religious centres, as well as their successors and those established later by the Augustinian, Benedictine, Cistercian, and Franciscan Orders, whose scriptoriums were responsible for the stunning illustrations and calligraphic art contained within medieval illuminated manuscripts. the Abyss (1000-1020) Ottonian art. However when the first Celts converted to the Christian religion and founded their monasteries, they needed copies of liturgical texts and Gospel books to study, and to preach with. As a rule, they made such copies from texts brought from Eastern Christendom, notably the Byzantine and Coptic (North African) churches. But with such a rich Irish heritage of decoration and ornamentation (albeit in metalwork and stonework), Celtic medieval artists could do much more than merely copy Eastern texts. Thus Eastern influence combined with the traditional flowing style of Celtic art, to produce the "carpet pages" and highly illuminated Gospel texts which represent the high-point of Christian celtic achievement. In addition, Irish Biblical manuscripts reveal traces of many other influences from countries outside the Christian world, including Egypt, Ancient Greece, Syria, Ancient Persia and Armenia. That said, Celtic illuminators seem to show a complete disregard for realism but a deep understanding of geometrical designwork. If Classical and the Byzantine art styles were both principally picture-based or pictorial, Celtic book illustration is purely abstract: indeed, all representative art in Celtic manuscripts is taken directly from the Byzantine style, mostly copied from examples in the monasteries' libraries. Celtic designs are curvilinear, flowing, circular and endlessly repetitive, although no detail or motif is ever repeated exactly. An early Psalm book and one of the earliest examples of medieval Christian art, the Cathach of St Columba, was written in about 600 CE (and is now in the Royal Irish Academy). 'Cathach' means 'fighter', and so it is not surprising to learn that the book was carried into battle as a magic talisman. It is written in Irish half-uncials (uncials are capital letters, and the word 'uncial' comes from the Latin uncia, 'inch' - St Jerome referred to 'letters an inch high' as' uncial') and decorated in a pure Celtic style. It does not contain pictures as such, or decorated borders, but instead has richly ornamented initial letters at the beginning of paragraphs. The simplest of these decorations is the outlining of the letters with red dots, a feature which makes the letters appear to be haloed in a rosy glow. Another characteristic feature is called' diminuendo'; the large capital letter is followed by a smaller one, and then a smaller one, and so on until a letter the same size as the text is reached. Abbot Ceolfrith commissioned three Bibles during his time as Bishop at Wearmouth Monastery, Northumbria - one stayed at Wearmouth, one went to Jarrow, and one was intended for presentation to the Pope. This last, now in the Laurentian Library in Florence, is the oldest known complete Latin Bible. The other great Irish and English Gospel Books of this time - the Book of Durrow (made in about 680), the Lindisfarne Gospel Book (c. 700), the Book of Echternach (c.700), the Lichfield Gospel Book (c.730) and the Hereford Cathedral Gospel Book, both made in the West of England in the eighth century - these so-called 'insular' manuscripts are spectacular in their rich ornamentation. Initial letters were filled with designs which were often based on those found on ancient Irish stone crosses and which signified the interconnection of everything. Rich swirls and complicated knotwork fill the voids of the letters and the serifs and terminals are exuberant with animal motifs, braids, chevrons, diamond spirals, and birds. The Book of Durrow is not a large book - it is only nine by six inches - but it is filled with wonderfully luxuriant embellishments, coloured with lemon yellow, warm red, and a deep copper green. It contains especially fine carpet pages, whole page abstract, multi-coloured designs of amazing complexity at which the Irish excelled. The historian, Cambrensis, described these illuminations as 'so delicate and subtle ... so full of knots and links with colours so fresh and vivid ... as to be the work of Angels .... ' After the Synod of Whitby in 664, at which the Irish and British declared joint allegiance to the Roman Church, and settled their differences over their contradictory methods of calculating Easter, the styles of the two areas became more closely associated. In about 635, the monks of Iona sent St Aidan and his colleagues to found the monastery at Lindisfarne on Holy Island, an inhospitable island off the Northumbrian coast. There the Lindisfarne Gospels were made, a book which took about two years to complete and is the work of a single scribe, who also did the illuminations. It is a work of outstanding beauty and sophistication, and was possibly meant as a showpiece to display with the body of St Cuthbert, the saintly hermit whose life is so well documented by the Venerable Bede, and who around this time was reburied at Lindisfarne in an elaborate shrine. The book contains a colophon on its last leaf. A colophon was the text which the scribe used to finish the work, much as we might use 'The End' today. Sometimes it included the scribe's name, the date, and the name of the person for whom the book was made. The Lindisfarne colophon was written in about 970, and mentions four participants in the physical making of the book. As this was written so long after the book was made, it is possible that its contents had long been the stuff of legends. Aldred's Anglo-Saxon gloss is the earliest surviving translation of the Gospels into English. The Lindisfarne Gospel Book is the most complete Gospel Book to have survived from the seventh century. It is written in the script known as insular majuscule, and contains marvellous examples of miniature portrait painting of the Evangelists, each with his own symbol - the winged man for Matthew, the lion for Mark, the ox for Luke, and the eagle for John. The major decorated pages are composed of pure ornament, amazingly intricate with many varieties of plaits and knotwork, keys, fretwork, and spiral patterns, contorted and interlaced birds and animals. The minor initials are highlighted with dabs of colour, often green or yellow, and outlined with the pink dots which are characteristic of the insular style. At one time, the Durham Gospel Book also belonged to the community of St Cuthbert in Northumbria. There is some evidence that the same hand may have worked on both the liturgical additions to the Lindisfarne Gospels and the corrections to the Durham Gospels: this may mean that a single scriptorium produced both books, or that scholars and scribes moved from place to place; or that the books themselves were sent to different places for critical appraisal. The Echternach Gospels may also have been made at Lindisfarne as a gift for the new foundation at Echternach in Luxembourg in 698. If this is so, the book would have been taken to the Abbey in Luxembourg by St Willibrord and his fellow missionaries. Echternach Abbey then went on itself to fulfil outside orders for manuscripts from communities which lacked the essential skills, or which were perhaps only newly founded, and by the early eleventh century was a leading scriptorium, making manuscripts for the emperors themselves. See also the Lichfield Gospels (Lichfield Cathedral), created some 30 years or so after the Echternach Gospels. The Book of Kells is the most famous, and the latest, of the great Insular Gospel Books. 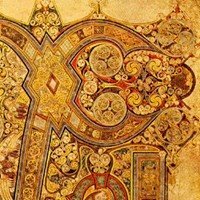 A masterpiece of Medieval art, it is written in Irish half uncial, but we do not know for sure whether it was written in Ireland - it may be English or even Scottish, but legend has it that St Columba himself created it in the sixth century on the island of Iona off the West coast of Scotland. The book was in the Abbey of Kells in Ireland, whence the monks of Iona had fled to escape the Vikings, and there the book also survived seven Viking raids between about AD 800 and their final attack in 1006, when the Abbey was burned to the ground. Since 1661 the Gospel Book has been at Trinity College in Dublin, where it may be seen and admired. The book is technically very complex and its manufacture must have been a huge undertaking. Not only does it abound with interpretative pictures with many layers of meaning, all of which help with the visualization of the text, but intellectually the illustrations express insights which Columba was said to have achieved - for example, his association with the Holy Spirit is stressed by decorative emphasis on Christ as being full of Holy Spirit. See, for instance, Christ's Monogram Page (Chi/Rho). It is continually decorated throughout with three types of letters: one is decorated with Celtic spirals, triskeles, triquetras; one is filled with highly stylized animal forms (lions are a continuing motif and each letter is unique); and last there is an angular alphabet, very different from the swirling, interlaced letters. The letters are much plainer but contain strong knots, and are sometimes outlined for extra effect. These angular letters also exist in the Lindisfarne Gospel Book which, completed in about 698, is much better documented. In the earliest of days, monasteries were sanctuaries of asceticism, but with the arrival of St Augustine and the complete conversion of the British Isles to Christianity, they gradually became more like training grounds for evangelists ready to spread the word of God. Christianity is very much the religion of the written revelation, and books which had been made for the glory of God alone now took on a slightly different purpose. They were now required as tools for missionaries. And as evangelical Christianity extended back into Europe in the seventh and eighth centuries, so again the purpose of books underwent another change. No longer only the instruments of missionary Christianity, they became also outward symbols of the wealth and power of noblemen and kings. Missionaries from the British Isles, having converted the Anglo-Saxons and securely established the rule of Christianity in Britain, carried the word of God back to Europe from about the eighth century, and the books they took with them influenced European artists. Charlemagne, King of the Franks from 768 and crowned Holy Roman Emperor in 800, saw himself as an emperor in the classical mould, and the beautiful books he collected and caused to be made were part of the trappings of imperial living. These books were indeed exquisite, often written in gold or silver ink on purple-dyed leaves to emphasize his links with imperial antiquity. The Roman satirist Juvenal had said that the Romans dyed parchment red or yellow because white became dirty too easily, and that purple was an extravagance, especially when written with gold or silver. The so-called Harley Golden Gospels are written entirely in gold, and although they were probably made near Aachen, Charlemagne's capital city, they show strong traces of English influence alongside the classical. Other books are also highly illuminated with gold, and must thus have been extremely costly. These rare books, several of which were presented by Charlemagne to the abbeys in his empire, were also objects of great monetary value and as such were highly prized diplomatic gifts and visible tokens of the power and splendour of the imperial court. There, Germanic warlord tradition met and mingled with the Roman civilization that Charlemagne was nourishing; he had to meet the expectations of his tribal subjects, and valuable books could be seen as loot. It seems likely that Charlemagne had a genuine interest in learning, though it is debatable whether he himself ever learned to read. He brought to his court many of the known world's greatest scholars, among them the Northumbrian scholar Alcuin, who was then in charge of the cathedral schools in York. Alcuin entered Charlemagne's service as tutor to the royal family, and went on to help inspire the revival of culture at Charlemagne's court. It was Alcuin who, as Abbot of St Martin's Abbey at Tours, established there an especially good Latin text of the Bible, and by the ninth century had begun at Tours the production of illuminated Bibles which was to make the town famous. One of the reforms Charlemagne undertook during his reign was that of education, and as part of this campaign he introduced a new, simpler, script. This is known as 'Caroline minuscule', and nearly all the manuscripts written during Charlemagne's reign are in this script. The earliest surviving manuscript to contain this script is the Godescalc Evangelistary, commissioned by Charlemagne and completed in 783, which commemorates both the baptism of his son Pepin by Pope Hadrian, and also his fourteenth anniversary as king of the Franks. When Charlemagne died in 814 his library, so lovingly collected, was sold. Beautiful books continued to be commissioned by Charlemagne's sons and grandsons - his son Drogo owned a Gospel Book written completely in gold, the so-called Codex Aureus (the Golden Book) made in 870, whose binding is encrusted with gold and precious stones. These dazzling articles were certainly not for everyday use, but were meant as conspicuous evidence of wealth and power. After Charlemagne's death and the division of his kingdom among his heirs, it was over 100 years before Otto the Great reunited the empire and again drew attention to learning and religious reform. A shrewd political leader, Otto integrated the state and Church into one administration, and laid great emphasis on the importance of books. However, it was Otto's grandson, Otto III, who, as ruler of Europe at the early age of eighteen, showed real enthusiasm for illuminated manuscripts. He employed no painters at court, but commissioned manuscripts from the great monasteries such as Trier. By then it had become common for laymen to work on these books, although within a monastic environment. 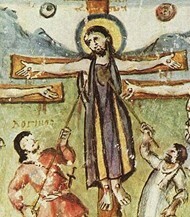 One of the artists working in the service of Egbert, Archbishop of Trier (977-993), was the so-called Master of the Registrum Gregorii, whose influence can be found in many contemporary works. At the time of the death in 1024 of Emperor Henry II, Otto's heir, the imperial library contained, among many other volumes, a fifth-century Livy, a copy of Boethius on Arithmetic, the great Bamberg Apocalypse, a Gospel Book rich with golden decoration (now in Uppsala University Library) and an illustrated commentary of Isaiah. Various distinctive schools can be distinguished, from the expressionism of Rheims to the more lifelike drawing of the human figure at Aachen. For more, see: Romanesque Illuminated Manuscripts (800-1150). It was at Rheims, one of the great royal monasteries, that the famous Utrecht Psalter (now in Utrecht University Library) was made. In this Psalter the artists illustrated the Psalms almost line by line, using monochrome line drawings. A copy of the Utrecht Psalter found its way to Canterbury, where it was copied several times over the next 200 years. The earliest of these copies is called the Harley Psalter and dates from around 1000. In it the flowing line drawings have become multi-coloured, a characteristic which was to become typical of Anglo-Saxon manuscripts. English book painting in the tenth century reached new heights, with Winchester and Canterbury being important centres of manuscript production. One of the masterpieces of this time is the Benedictional made for St Aethelwold, Bishop of Winchester for twenty years from 963. This manuscript, which we know to have been made by a monk named Godeman, contains the text of the blessings which the Bishop himself would have used at Mass on feast-days. The most important of these feast-days are marked by miniatures containing meticulously drawn figures and foliage extravagantly embellished with gold. Anglo-Saxon England had a remarkably rich literary tradition, in particular in the vernacular; indeed it was the richest in Europe, and included many translations of Latin works as well as original poetry. Aelfric, a pupil of St Aethelwold and later his biographer, translated the first five books of the Old Testament (the Pentateuch), and the versions made at the beginning of the eleventh century are exceptionally rich and varied in their illustrations. At this time, the very splendid English monasteries would all have had quite large libraries. We do not know which books they all had, though some of the great foundations kept detailed records which have survived. Of course every monastery would have had at least one Bible, probably more - and sometimes bound in up to four huge volumes. At least one Bible would have been kept in a place accessible by all the monks; they were far too big to be carried around for private use, and in any case a manuscript book was too precious to be carried about. In addition a monastery library might have contained separate books from the Bible each containing a commentary (or 'gloss'); works by churchmen such as St Augustine, Bede, and St Jerome on such subjects as the Psalms; perhaps classical texts such as Livy or Virgil. These works would have helped to build up libraries which were regarded at the time as storehouses, complete with all the information about the world it was possible to have. There would also have been service books of all kinds, from psalters to books of music. The latter, smaller in format, would have been used on a day-to-day basis and copies have not survived in the same way as the great Bibles have. Books which did not fall to pieces in daily use were largely destroyed at the time of Henry VIII's dissolution of the monasteries in 1532, when the liturgy underwent extensive change. For private worship Psalters were popular, and several survive: one, for instance, from a Psalter probably made at the great nunnery at Shaftesbury, Dorset, for a lady who may have been a nun or who may have been a lay friend of the Abbey; another, a Psalter made for Queen Melisende of Jerusalem in about 1150. Melisende was regent of the kingdom in the Holy Land which had been established as a result of the First Crusade in 1096, and it is clear from the number of manuscripts which survive from this period that Jerusalem must have contained a substantial book-buying population. There were also several religious foundations in and around the city - at least until the kingdom fell to the great Saladin in 1187. Literacy was still not widespread by the end of the twelfth century, and very little was written that did not have some sort of religious context. The importance of the great religious foundations cannot be over-emphasized - the Benedictines, the Cluniacs, the Cistercians, the Carthusians headed a highly spiritual population. St Benedict (c. 480- 547), who is the founding father of Western monastic life, and of the monastery at Monte Cassino in Italy, had directed members of his Order to read, to make books, and to study. (The oldest surviving copy of his rules for monks is dated 700 CE and is in the Bodleian Library, Oxford.) By 1200 there were over 500 monasteries in England, all in need of books. There must have been a thriving business in book production. The finest Gothic illuminated manuscripts include (from France) the Ingeborg Psalter, Psalter of St Louis, Bible Moralisee; (from England) the Amesbury Psalter and Queen Mary's Psalter; (from Germany) Minnesanger Manuscript, the Mainz Gospels and the Bonmont Psalter; (from Bohemia) the Passional of Abbess Kunigundathe and the Velislav Bible; (from Italy) Lucan's Pharsalia. The greatest Gothic book illuminators include: Jean Pucelle, best-known for The Belleville Breviary (1323-26, Bibliotheque Nationale, Paris) and the Hours of Jeanne d'Evreux (1324-28, The Cloisters, Metropolitan Museum of Art); as well as Niccolo da Giacomo, Matthew Paris and W de Brailes. The last Medieval manuscript illuminations were the courtly and more decorative International Gothic illuminations, produced by painters like Jacquemart de Hesdin (c.1355-1414), the Limbourg Brothers (Pol, Herman, Jean) (fl.1390-1416) and Jean Fouquet (1420-81). Illuminations were also produced on the Indian subcontinent. Note, in particular, the Gujarat school of illuminated manuscripts, renowned for its kalpasutras - holy texts of the Jainist faith, executed, like Pali manuscripts, on palm leaves. See: Post-Classical Indian Painting for more.  For information about the early cultural history of Monastic Ireland, see: Irish Art Guide.